15. Names similar in spelling or pronunciation to the classes of names listed above. 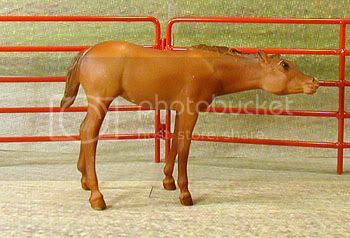 I will definitely allow any outcross that results in a foal eligable to be registered as an Appaloosa, Paint, Quarter Horse, Appaloosa Sporthorse, or registered with any other well-known registry. I will probably allow other reasonable outcrosses from most of my horses, just ask before sending the breeding request, thanks! Sire's race record: (38)18-10-6, $9,616,360, Champion 3yo Colt, 2X Champion Older Male, Horse of the Year. Dam: 3 wins at 2 and 3. Lines to: Skip Trial, World Appeal, Noholme II. 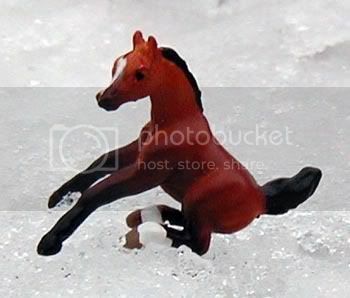 Model information: Breyer Stablemate scale G1 "Swaps" mold; 12-Piece Stablesmates Set, special run for the JCPenney holiday catalog 1997. Lines to Swaps, Seabiscuit, Banqueroute, Buckpasser. 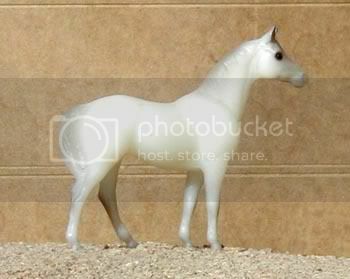 Model information: Breyer Mini Whinny scale Sitting Foal mold; Mini Whinny Foals set, produced 2005-current. Sire's race record (MRF): (20)6-5-4-2; Dam: (5)3-2-0-0. Lines to Pretense, Exclusive, Bold Ruler, and top model horse broodmare Diamond Clips. 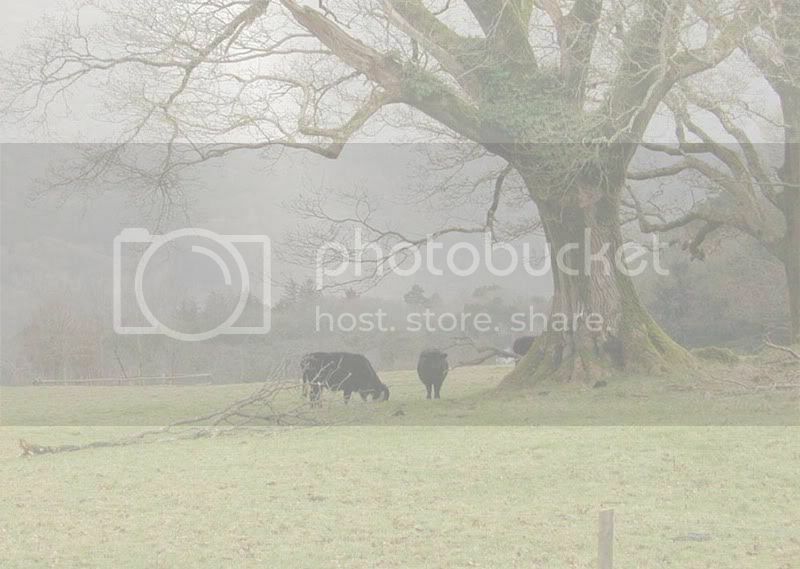 Awards: MRF race record: (3) 1-0-1-1 (with Coldspring Farm); photo and live show placed. 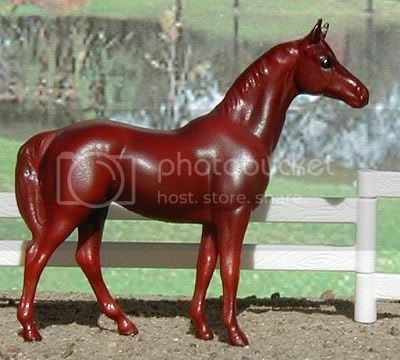 Model information: Breyer SM G1 "Swaps" mold; #5176 Thoroughbred Racehorse, produced 1995-1997. Lines to Alysheba, Alydar, Weekend Surprise, Secretariat, Swaps. 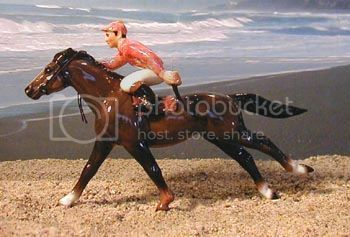 Model information: Hagen-Renaker Specialty Series Thoroughbred with Jockey. Sire's race record (MRF): (16)8-2-1-2; Dam: won $31,969. Lines to Big Spruce, The Axe, Cox's Ridge. 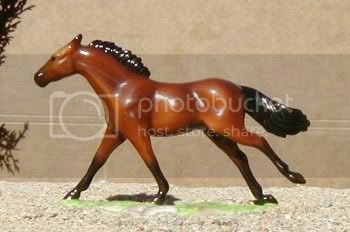 Model information: Breyer SM G1 "Citation" mold; #5175 Standing Thoroughbred, produced 1995-1997. Sire's race record: (33)12-5-3 $2,330,954; 1990 Champion 2yo colt. Dam: Winner at 2, $20,470; full sister to Green Line Express. 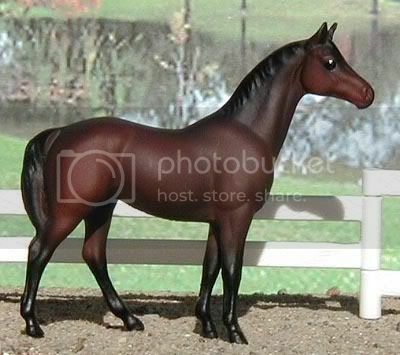 Model information: Breyer SM G2 Thoroughbred mold; #5602 Thoroughbred, produced 1998-2002. Sire was influential in the US and Australia, lines to Hail To Reason, Damascus. Dam is a race winner and dam of two other race winners, dam's lines: Bletchingly(r), Song of Norway(r). 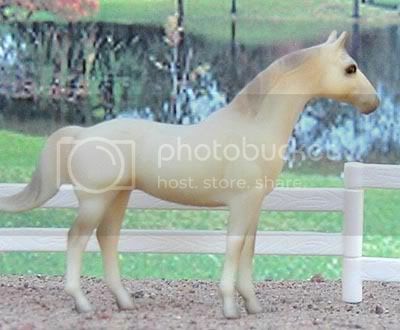 Model information: Breyer SM porcelain Thoroughbred mold; "Seabiscuit", special run for the 2003 Breyerfest, 750 produced. Lines to: Seattle Slew, Pleasant Colony. 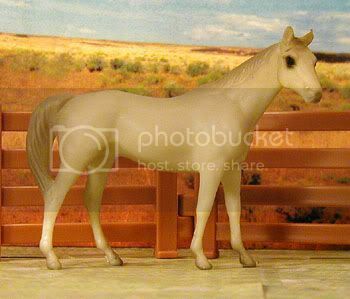 Model information: Breyer SM G1 "Silky Sullivan" mold; Set of 12 Miniatures, special run for the 1995 JCPenney holiday catalog. Sire: 4-2-2; sire of 117 stakes winners incl. Detroit (Horse of the Year), Gold River, Triptych, Irish River, Rousillon, Bahri, Lahib, Half A Year, Qirmazi. Dam: Unraced but full sister to River Journey (multi-stakes placed). 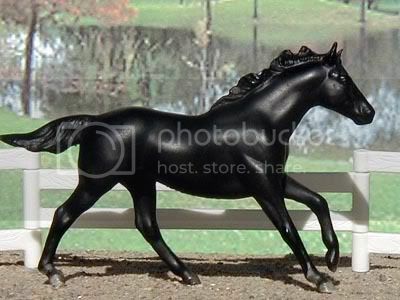 Model information: Breyer SM G1 "Silky Sullivan" mold; #5650 Saddle Club Stablemates Collection, produced 1996-1997. Lines to Mr. Prospector, Raise A Native, Native Dancer, Gold Digger, Secrettame, Secretariat, Nijinsky, Northern Dancer, Crimson Saint, Crimson Satan. 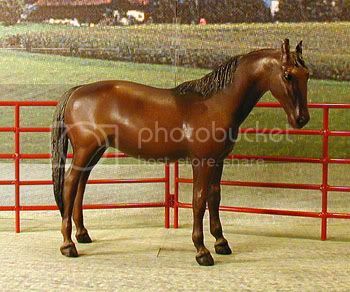 Model information: Breyer SM G1 "Swaps" mold; 12-Piece Stablemates Set, special run for the JCPenney Christmas catalog in 1996. Lines to Palace Music, Northern Dancer, Bold and Brave, Bold Ruler. 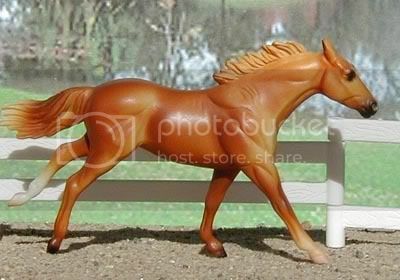 Model information: Breyer SM G1 "Seabiscuit" mold; #5025 Running Thoroughbred, produced 1991-1994. Sire's race record: (33)11-7-8. Lines to Never Bend, Nasrullah, Round Table, Jet Action, Firm Policy, Princequillo. 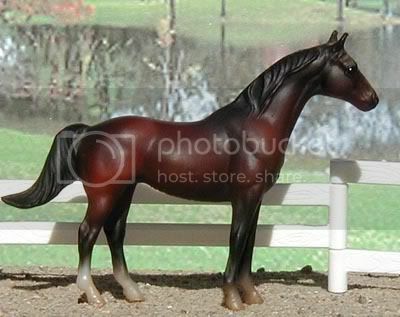 Model information: Breyer SM G1 "Citation" mold; #5019 Standing Thoroughbred, produced 1991-1994. Lines to Nashua, Nasrullah, Searching, War Admiral, Jet Action, Firm Policy, Princequillo. Model information: ID adopted from Coldspring Farm; will have a body assigned eventually. Lines to Riva Ridge, Native Dancer, War Admiral, Man O War, Ack Ack. 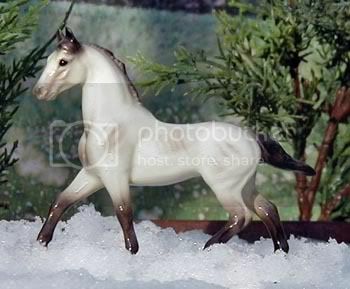 Model information: Hagen-Ranaker Specialty series "Quicksilver;" produced unknown, discontinued. Sire: (18)14-2-2, $580,647; 1964 Champion 3 Year Old & Horse of the Year(Canada), 1st non-human in Canada Sports Hall of Fame. Lines to Lucky Debonair, Count Fleet, Warfare. Model information: Breyer Suckling Foal mold; #3155 Thoroughbred Mare and Foal Gift Set, produced 1973-1984. Sire's race record: (16)9-3-0 $370,960; sire of Debonair Prince (Horse of the Year in Venezuela). 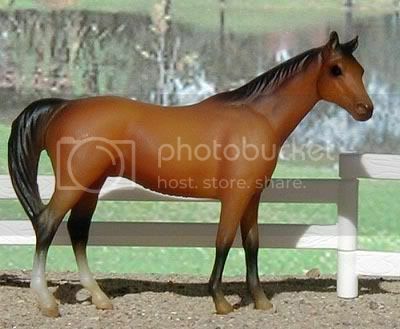 Model information: Breyer Thoroughbred Mare mold; #3155 Thoroughbred Mare and Foal Gift Set, produced 1973-1984. Sire's race record: 51-30-10-3, $970,605; Lines to: Bull Dog, Nasrullah, Devil Diver. 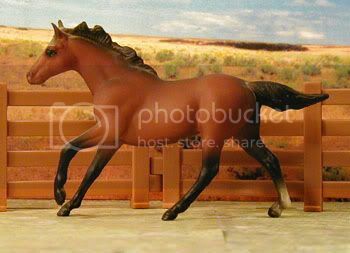 Model information: Breyer SM G1 Seabiscuit mold; 12-Piece Stablemates Set, special run for the JCPenney holiday catalog 1996.